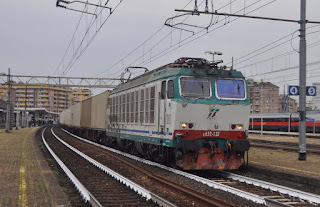 Probably the most interesting Italian loco we saw- E652 132. Fortunately it wasn't quite the first train in the morning to get me to Gatwick airport for the Easyjet flight to Milan Malpensa- either way it wouldn't have mattered too much as we arrived at the airport to find that it was the only flight all morning which was showing 'delayed'. This meant time for an overpriced Weatherspoons airport breakfast before we eventually took to the air around 80 minutes late. 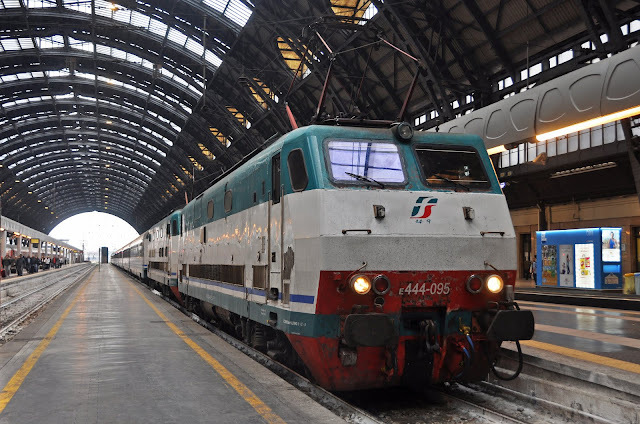 We were naturally later than we expected to be into Milan, and the journey in from the airport was hardly an 'express' service either. After taking a bus from the 'cheap' terminal to the station we then had to work out the ticket buying process- not aided by the slowest ticket machines in the world. 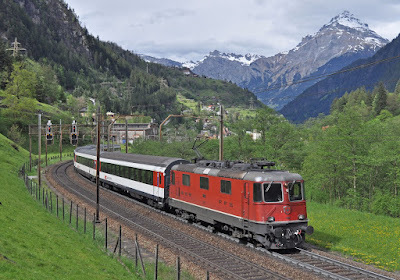 Eventually, having just missed the train we were going to take, we concluded that the fare was the same for the 'Malpensa Express' as it was for a regional train. The journey was tediously slow and not helped by a drunken nutcase Italian woman who was wandering up and down the train shouting and throwing crisps around. We were rather relieved that her only weaponry was a bag of crisps and paper bag as she was causing quite enough terror with these! Ada the guard obviously hid in the driving cab but did call the police to remove her later on in the journey. All this meant that arrival into Milan Central was not until around 15:30- rather later than I had anticipated having got up at 05:30!!! We checked into 'The Best' hotel (it was ok) about 10 minutes walk from Central station and then went in search of some lunch and some trains. 'Peter Witt' verses 'Slug'- I know which I would pick! We headed to Milan Lambrate as with time ticking on and nowhere better planned it seemed a good place to see some trains, my two friends Rhys and Jon had not really seen Italian trains before, and I had only travelled round it on a semi-normal holiday so everything was going to be interesting- even the E464's. 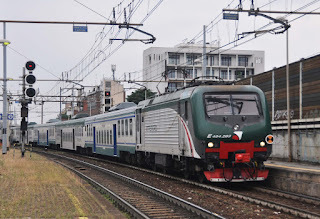 The station is busy and photos weren’t too bad (no hassle) with a range of EMU's and E464's on local TreNord services as well as various High Speed trains and some E444's on IC's with the solitary E402. 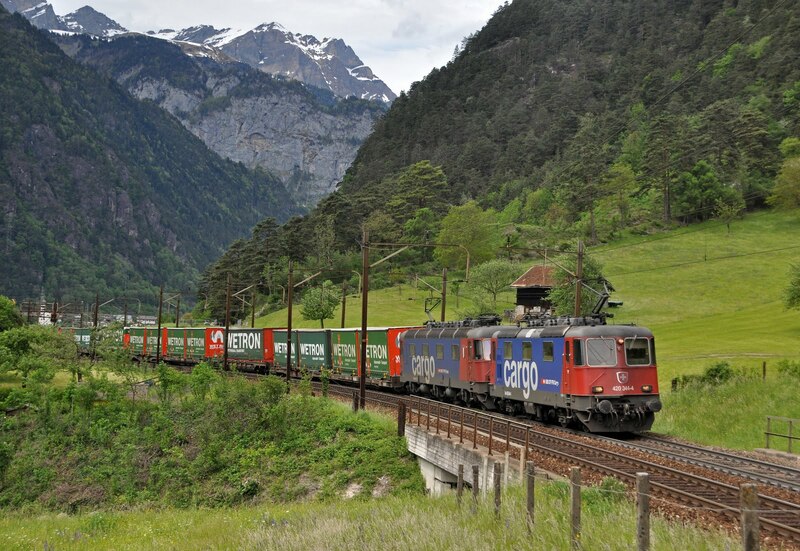 We only saw two freights, one with E652 132 and another with a pair of Captrain Traxx locos. 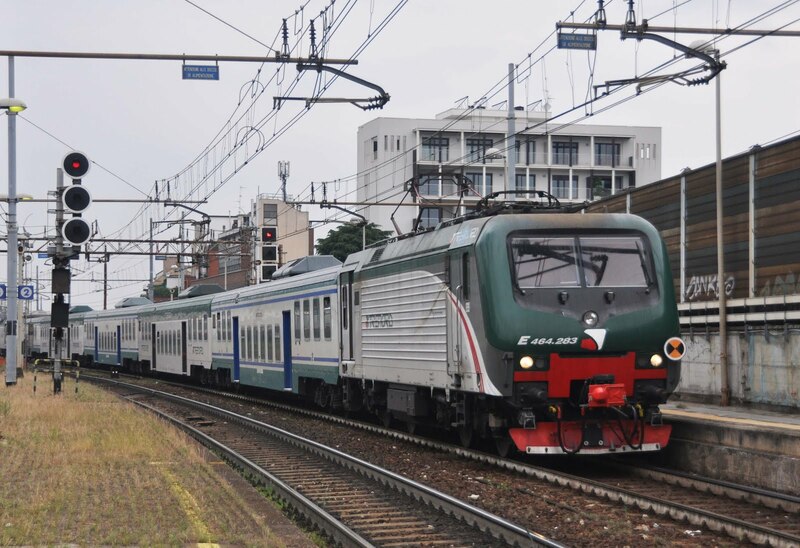 Another E652 was seen light engine. 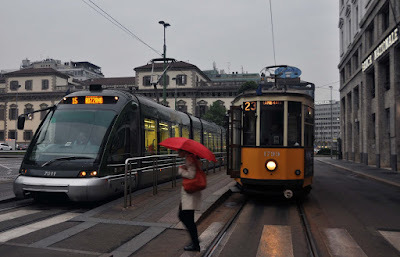 Next time for a quick spin to Central and back with some E464's for a quick photography session before back to Lambrate to pick up one of the old 'Peter Witt' tramcars on route 23 to the Duomo and dinner. Our time in Milan was only short, and we didn't get up as early as intended (this was to be a recurring theme)- but we did feel better for it. We headed first to the main station to sort out our tickets into Switzerland later. Jon had pre-booked on the 12:25 to Bellinzona, but the rest of us were on FIP. The ticket Ada was very helpful and booked us on the same train, even seated around the same table- excellent and painless (Well... more on that later!). 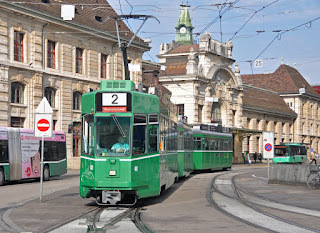 We then headed by metro and tram down to the Castle area to be tourists and to photograph a few more of the Peter Witt tramcars, which I absolutely love- I'm sure Croydon needs one or two?! A quick dash as always as we left it to the last minute to collect our cases and buy pasta & prosecco for the days ahead meant we didn't get to the station until about 12:20 for the 12:25 train. Tight. You can imagine then our dismay when the ticket lady looked our tickets and said 'no'. 'What?- we have booked on the 12:25!'. Unfortunately it turned out plain as day that Ada downstairs had booked the two of us on the 10:25- 'These tickets are not for this train', and they weren't. With 3 minutes until departure there was no chance we were going to get them changed, and Jon wasn't about to book another full open fare for the next train (none of us were keen on waiting 2 hours either)- fortunately after much pleading common sense eventually prevailed and the barrier lady agreed we could as ask the guard on the train. Fortunately he was more sympathetic and while the tickets were no good it would be ok if we stayed in his coach, but only as far as Chiasso. His coach happened to be 1st class, and we enjoyed a very nice, if slow ride eating our pizza slices up to Chiasso. Once there we then had to get off... speak to the new Swiss crew and plead to be allowed to stay on to Bellinzona. Fortunately the Italian crew passed the message on and when the grip came through we were brushed aside with a 'Ah- it is you'. commonly referred to as an RE 10/10. 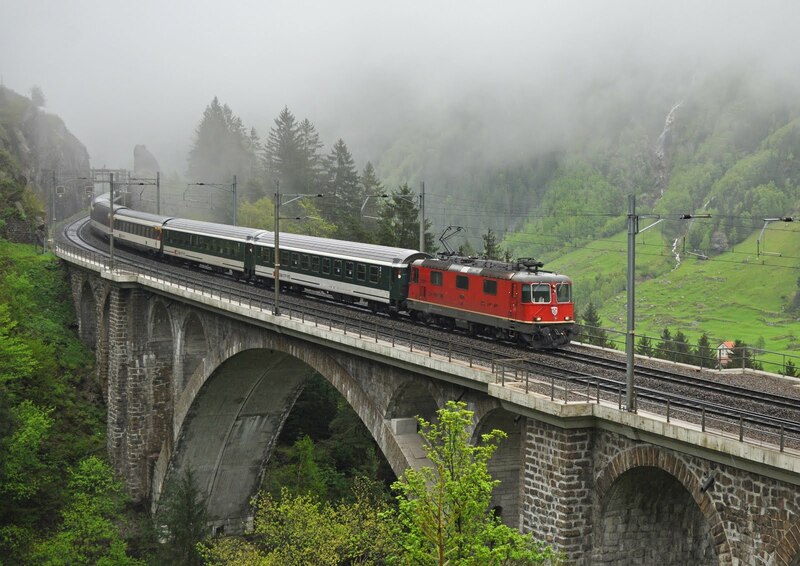 Of course due to late running we missed the hourly loco-hauled Regional train over the Gotthard, and as we had been looking forward to the RE 4/4 we elected to wait around in the gloom for the next one from Lugano. This arrived with 11243 and, to our pleasure some 'fresh air' coaches at the front. 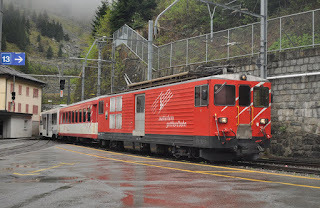 The Gotthard is a spectacular line and we enjoyed the climb up to the tunnel at Airolo. As we burst out of the northern portal at Goschenen we were all absolutely amazed to see clear blue skies and brilliant sunshine- the southern ramp and all of Italy had been enveloped in gloom! A change of plan was made and rather than taking the train through to Arth-Goldau we got off at Erstfeld to get some pictures- the forecast was awful for the week so we weren't going to waste any more of this sunshine. We stayed out as long as the sun did and then made our way back to Wassen using the bus (which seemed to accept our FIP coupons with no problem) and our accommodation for the next 3 nights the 'Gotthard Backpacker' hostel, which was absolutely fine, especially as we were the only ones there! We joined another group after dinner at the nearby Hotel Gerig and listened to tales of their day of perfect weather. Fingers would have to be kept cross that we had similar luck. crossing the impressive mid-level viaduct back up the valley. The weather did not dawn bright and by the time we had slept in and made breakfast it was gone 10:00. 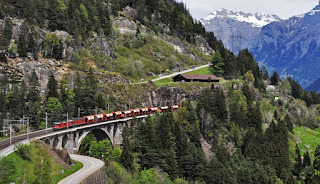 Our first stop for the morning was on the high level line at Wassen where we spent a couple of enjoyable hours watching the trains go by. The line was fairly busy and by the end of our time here the weather had dramatically improved and there were even a few spots of sunshine- not at the same time as any trains though! After lunch (sandwich) we moved by means of the bus back to Erstfeld where we wanted to have another go at a shot from the previous day, hoping the sun would stay out. It wasn't to be and after an hour or so where the sun insisted on shining only when trains weren't passing it was time to move on for some better light. Next stop was Gurtnellen which netted what were to become our last 'full sun' photos in Switzerland. We had an excellent few hours here until the sun started to dip- at least getting one decent shot of an RE 10/10 in the sun in the right direction. Unfortunately while dithering we missed the passing of the evening southbound postal train, though the sun had moved across to the other side of the valley anyway. During the faf we had also totally missed the bus back to Wassen and with a 50+ minute wait we decided instead to embark on the walk. This was most pleasant and located a few more photo spots to maybe come back to. Finally we finished with a stint in the famous churchyard at Wassen as we'd not yet visited- another place to come back to when the weather was better. Tonight it was the turn of that pasta and prosecco from Milan. It turns out I hadn't bought enough sauce, but two bottles of prosecco and a bottle of wine went down rather too well. By the time we had finished playing one of the Hostel's board games (which I think we mostly understood eventually) it was 02:00! Ah well... lie in again if the weather was poor. 11198 emerges from one of the Biaschino loops with the IR. The weather was more than poor. We woke to discover that Wassen was basically in a cloud. By the time we had cooked sausages for breakfast most of the morning was behind us. We decided to head back through the tunnel to see if the weather might be any better on the South ramp (it couldn't have been much worse). 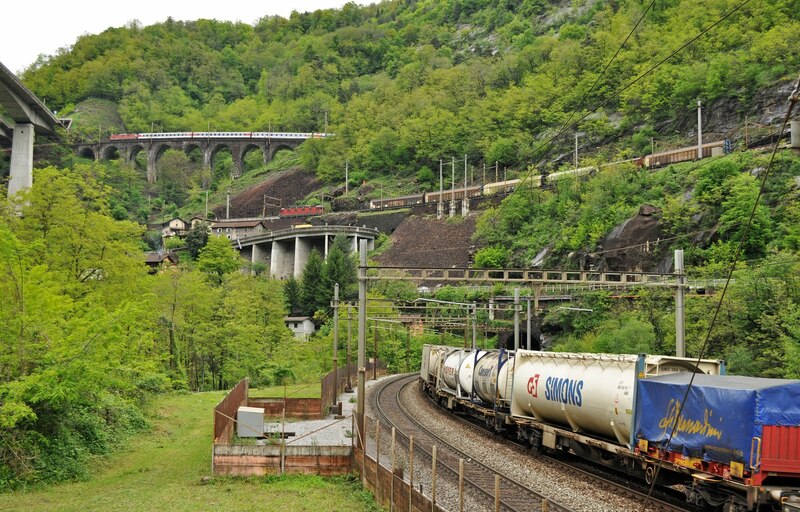 Travelling by way of Biasca (with RE 4/4 11196) and then the postal bus back to Biaschino loops where trains can be seen at all three levels. It had stopped raining by this point but the weather was far from what we had hoped for. Still the wonders of the Gotthard did somewhat make up for it. After a few hours we were damp enough to head back on the Postal bus up to Faido to pick another RE 4/4 (11198) up back to Goschenen. The weather here hadn't improved and the rain had reached levels where you really did get wet. 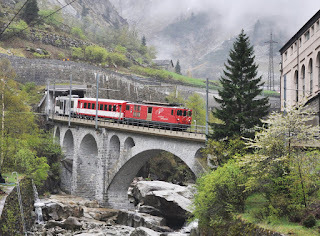 It wasn't quite time for dinner yet so we filled in some time taking a ride to Andermatt and back on the Matterhorn Gotthard Bahn narrow gauge railway. I'm sure the journey would have been even more spectacular had we been able to see more than a few hundred meters! Deh 4/4 94 too us up the hill and 95 took us back again. We couldn't quite work out how to buy a FIP ticket at Goschenen so relied on speaking to the guard on the train- only there wasn't one! 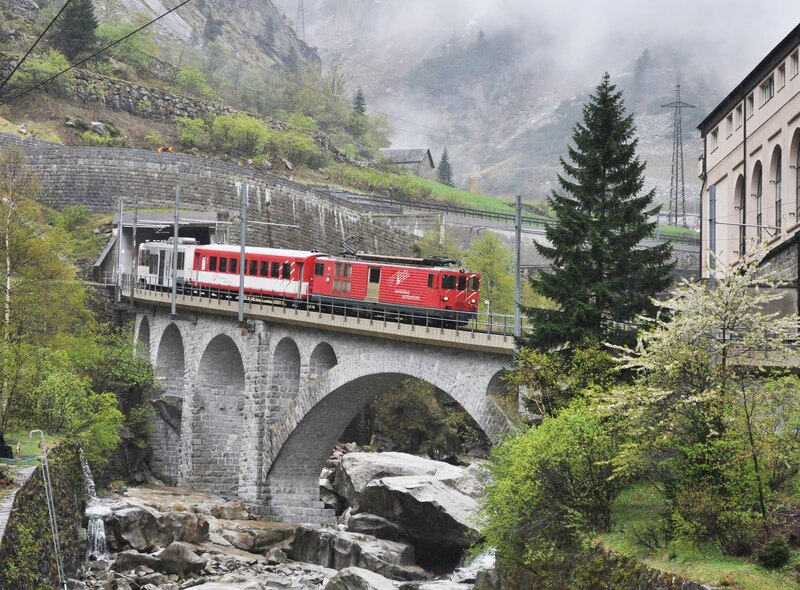 We therefore did the honest thing and purchased returns from the ticket office at Andermatt. This is a really fun railway I'd like to spend some more time with (and in better weather). Back at base we headed back to Hotel Gerig for our final meal in the Gotthard, and final evening with Jon who would be flying back the next day. 111200 emerges from the cloud on the mid level at Wassen. Not quite such a late start but still the rain persisted. Either way it was our last day on the Gotthard and we had barely touched the photo spots at Wassen. We began in the churchyard and then headed down to the curve on the lower level. Freight levels were not huge but there was enough to keep us entertained despite the rain. Did I mention it was raining? Our shoes soaked through, there was one more location on the mid-level to try before we finally got out of this sodden valley. The photos over the mid level viaduct were interesting, but sadly not the glorious views with mountains behind but instead the train appearing from out of a cloud! Oh well. Deh 4/4 93 on the narrow guage at Goschenen. 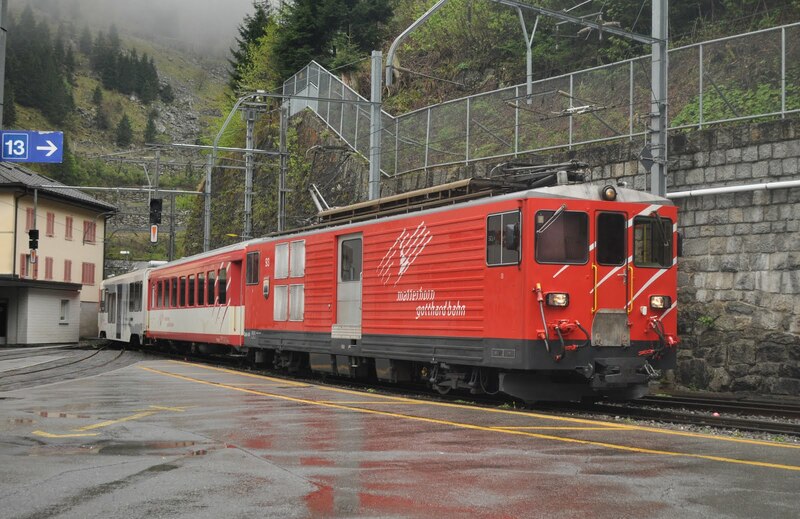 RE 4/4 11198 was our chariot out of the Gotthard from Goschenen to Lucerne where 11245 took over after the train reversed. By the time we reached Basel the sun had almost come out it had stopped raining and was time to search for a reasonably affordable dinner. We stayed at the Hotel Schweizerhof just outside the station which I feel should have cost more than we paid for it. Maybe the construction site outside the window had something to do with it? 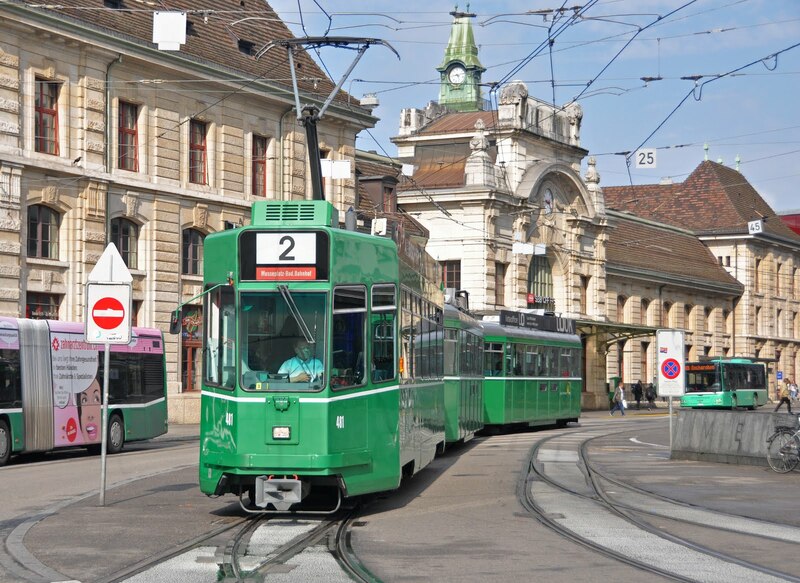 Semi-attractive trams in outside Basel SBB. We had the morning at our leisure in Basel before beginning the long rail journey back to the UK through France- even the sun had come out now we were leaving the country. We had elected to find a cheaper breakfast than the 25CHF offering at the hotel and ended up in a very nice cafe across the road. Our new breakfast was cheaper but being chingged around 60.8CHF for a small orange juice (not far off £5) was a bit of a wakeup call! A few tram photos then we headed over to the main station. Gotthard liveried 460 079 was in the station, so having spent a few days on the line we got on for a quick spin down to Liestal. 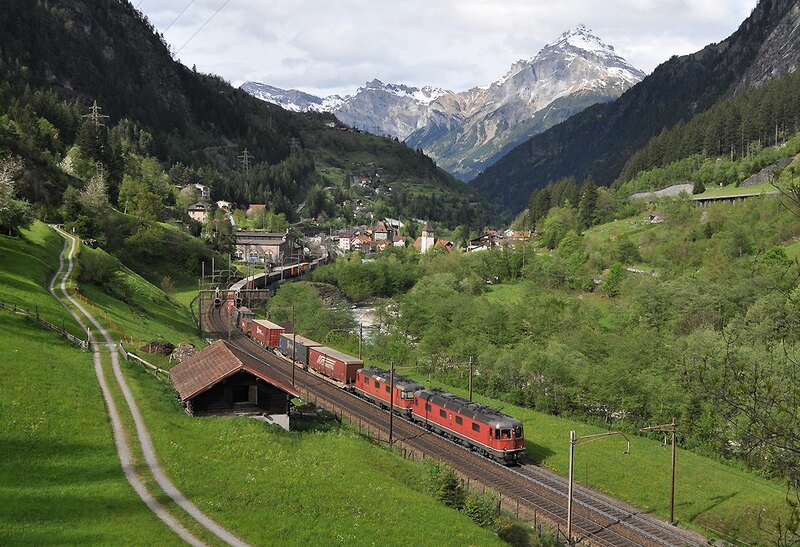 From here we took 460 070 on another short hop to Olten. 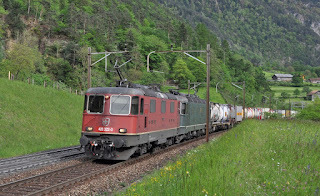 From Olten 460 007 was picked up for the run back to Basel, well... that was until we overtook a pair of BLS 'Brownies' outside Liestal. Quick change of plan and we bolted off the train for a shot of RE 4/4 174 and 190 passing through. 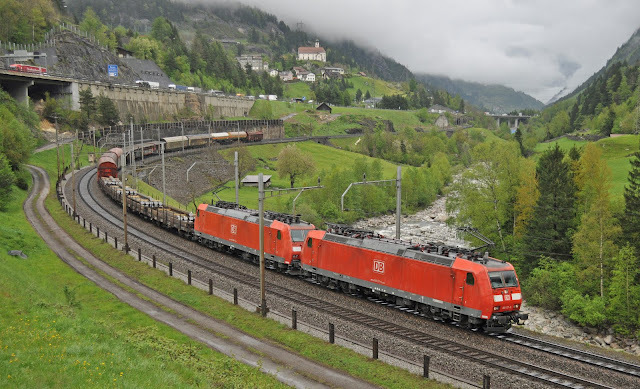 schemes, 450 079 pauses at Liestal. It wasn't long to wait for our next option back to the city with RE 4/4 11197. 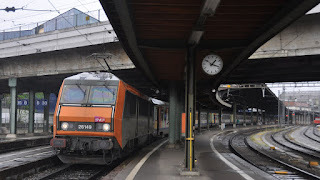 A few more shots of Basel SBB before we took the suburban train (our first unit for days) across to Basel Bad Bahnhof- just to see what was there. Suddenly everything had changed colour and we felt well and truly in DB land! 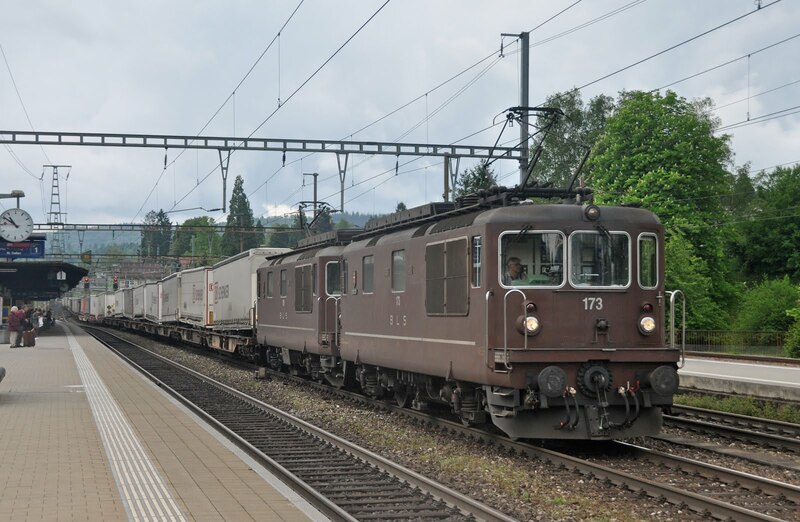 A DB 111 was stabled with a set of N-Wagons for presumably a peak working later, a couple of DB 120's (110 and 141) and DB 101 100 were stabled along with Hectorrail Taurus 242 502. A DB 146 was seen leaving with a regional service and at the north end of the station was a variety of BLS traction including 465's and five of the 'Brownies'. The station is clearly fairly busy for freight and two trains were seen during our short visit, a pair of Crossrail Traxx locos on a southbound train and a Railpool/BLS Traxx on a southbound. As we took a tram back across the city the heavens once again opened and we dashed back to the hotel to get our bags before heading into the station for the final time. 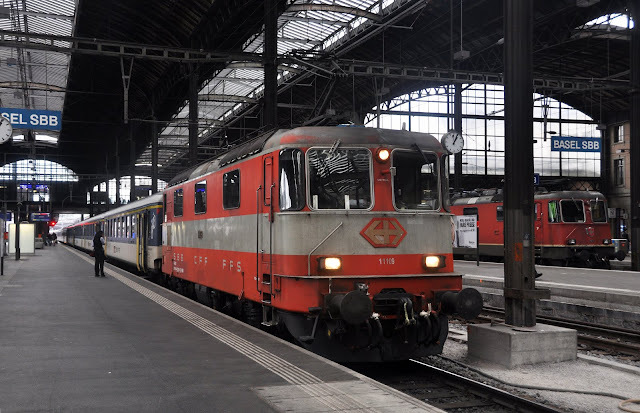 SBB had one final treat for us with 11109 in 'Swiss Express' on old stock working the 13:07 to Zurich- up on the boards as an ICE, so presumably a failure?! It was decidedly wet again as we left Basel behind BB26149. 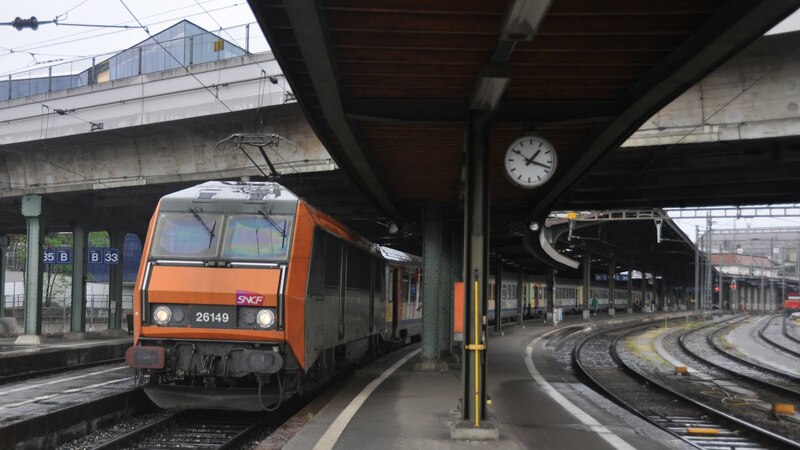 We crossed the old frontier into Basel SNCF and entered France with BB26149 on a TER 200 to Strasbourg. There was just time for lunch here (well... to buy a baguette) before boarding the first of our regional trains to get us back towards Paris. 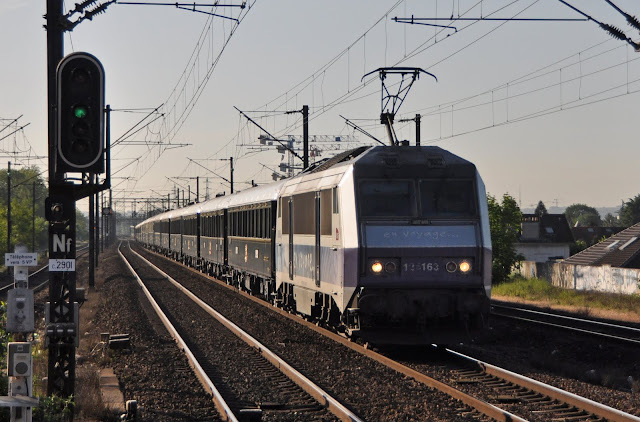 Of course the plan had been to head back the 'traditional' way with a big CC72100 on Line 4 via Belfort, however SNCF had other ideas and had withdrawn all these trains for digging at Nogent sur Seine in the Paris suburbs forcing a re-think. The train from Strasbourg to Nancy was a very crowded Regiolis, the first I had had the displeasure to travel on. It was ok. Nothing special. Nancy however seemed a very pleasant city, which was not quite done justice by a 1 hour visit. Outside the station we discovered the strangest sport named 'Disco Foot' which appeared to be some sort of football where all the players constantly danced to disco beats... when the music slowed down they did too. Only the ball didn't as the pitch was on a slope! Odd! BB26007 flys through Bar-le-Duc. Just a shame that it carries a non-livery! An AGC took us on to Bar-le-Duc from where we could finally take another 'proper' train for the last leg into Paris. We got a picture of BB26007 passing through in good light with Corails, what it was doing I have no idea as I didn't think loco hauled trains came out this way other than the Champagne-Ardenne TER's? BB15007 at Bar-le-Duc waiting to work the 19:37 to Paris Est. BB15007 was our haulage on the 19:37 to Paris- regrettably not one of the attractive 'Grand Comfort' livery locos which often ply this route, but we couldn't really complain with a nice Corail compartment to ourselves for much of the trip. Being a nice day and the right time of the year it was daylight for almost the entire run in to Paris Est which made it a very pleasant trip. All that was left was to check into Hotel Avalon (fairly average in my opinion) and head into town for a late dinner. BB26163 hauls the Venice-Simplon-Orient-Express through Le Raincy Villemomble Montfermeil as it heads into Paris Est. Our last day was supposed to have a leisurely start, but we'd had quite a few of them and had noticed the previous night at Paris Est that both the VSOE and Moscow sleeper were due in the morning. The day dawned sunny again (why couldn’t it do this when we needed it at Wassen!?) which meant that there was nowhere reasonable to photograph these inbound trains. We headed on the RER E to Le Raincy Villemomble Montfermeil (quite a mouthful!) to catch the trains and then decided to try the new station at Rosa Parks for the return shots. This didn't go too well as the view isn't fantastic, the Sleeper didn't leave and an RER train got in the way of the VSOE! Back at Est CC72179 with it's messy front arrived from Culmont-Chalindrey- was the line not shut after all?? taking part in Le Grand Train in Paris. Half the reason for coming to Paris was to have another go at 'Le Grand Train' at the former depot at La Chapelle- this time it was open! I have to say I thought the display of locomotives was very good, particularly those inside the shed and we easily spent 90 minutes wandering round and taking photos. Being early in the day the place wasn't too busy which probably helped. It is worth noting that not everything is accessible and there are several fences between the public and CC72049, BB9301 and A1A-A1A 68523. This was a shame as I really wanted to photograph these, but instead I rather fell for CC65001 inside the main shed. I wanted to support the event by buying lunch here- but either didn't fancy the offerings or just couldn't work out what they were. Sandwich from the supermarket it is then! I had refrained from commenting how well behaved France had been so far... something was bound to go wrong wasn't it? Ah yes- we arrived at Paris Nord for our train to Boulogne to discover that it wasn't on the boards. There was a train to Etamps Le Torquet a few minutes before we were expecting. That wasn't good as we had a Eurostar booked from Calais. Having been bowled out by the diesel on the Montlucon turn less than a fortnight earlier I wasn't keen to let the Boulogne line get away without a fight and we boarded the train which was now not going to Boulogne. Station staff were advising anyone heading to Boulogne to wait for the next TGV (over an hour away). To be fair to the train conductor he was very helpful and advised us that the train schedule had been changed because of an 'accident' between Amiens and Abbeville. There would be a bus, he said, from Amiens to Boulogne. 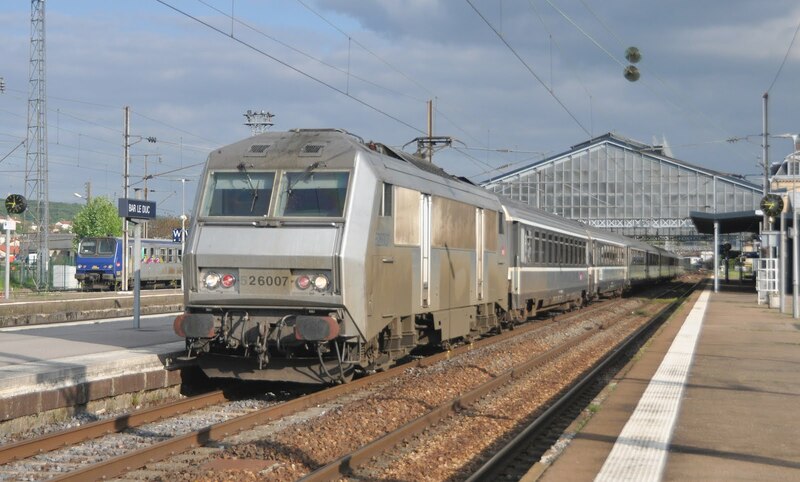 This wasn't good news- but at least we knew what we were dealing with- and with the help of the Interrail App a new route was found from Amiens to Boulogne by a precession of Units via Lille. My favorite loco of the trip- CC65001 at La Chapelle. On arrival at Amiens the situation had changed a bit and buses were showing on the screens for Abbeville. The information lady with drawn on lips advised me that buses were about to leave from Gare Routier for Abbeville and that a train connection would then continue to Boulogne- still a chance of the diesel then, and just as importantly, maybe I would get my required track between Rue and Etaples (You'd not think I needed it from the number of times I'd visited this line would you!?). The buses took 45 minutes to reach Abbeville using the local roads and as we approached the station we could see the welcoming site of Corails. 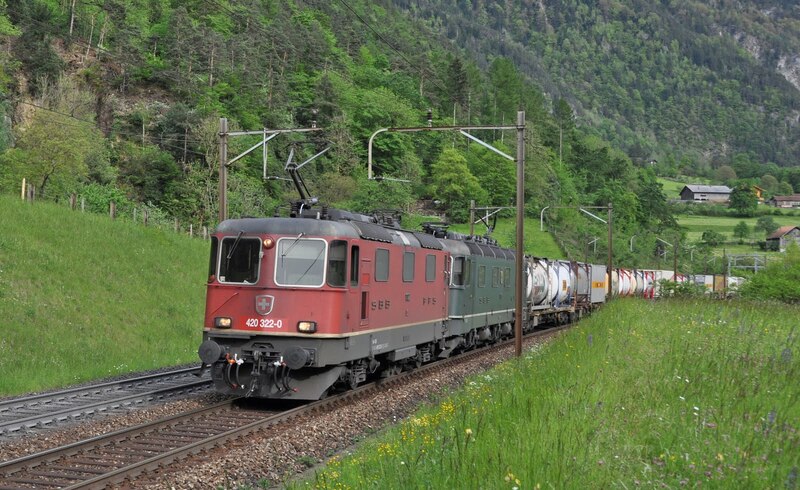 Then we saw a nice blue diesel (BB67570) on the south end of the train- so that wasn't going to Boulogne. It turned out this was the next southbound Paris train which was being held for at least an hour before hoping to continue down the line. 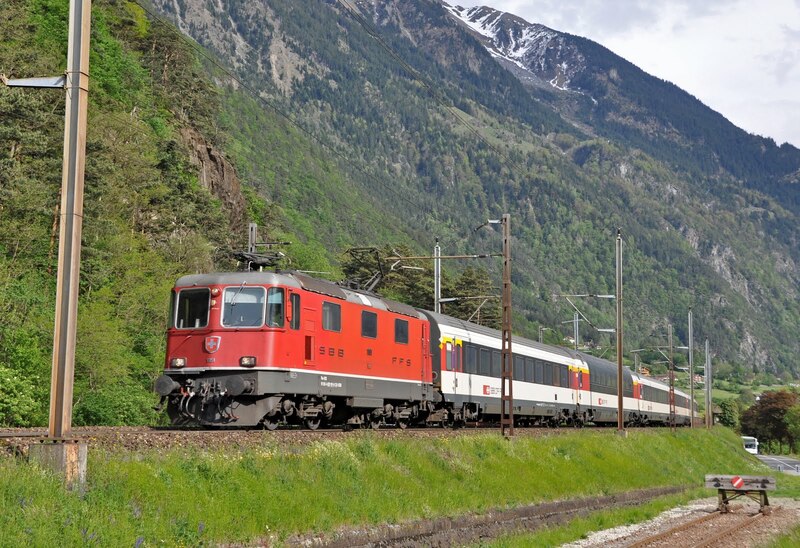 Our train to Boulogne would be the AGC unit in the other platform. A disappointment, but I have to hand it to SNCF, the train had waited for the buses to arrive and everyone made it to Boulogne only 40 minutes behind schedule. Our final domestic train, picks us up at Boulogne Tintelleries. The trip really felt nearly over now, there was time to wander around Boulogne (we did eventually find the nice bit) before boarding our final AGC to Calais Frethun. We had over an hour to wait until boarding of the Eurostar home, but there wasn't a lot we could do about that. As A final annoyance I wasn't allowed to take a picture of 3201 arriving into Frethun- it was required as well! This was the only problem with photography all trip, I guess it was understandable. This was a good trip with great company (thanks again Jon and Rhys) which sadly had the edge taken off it by the poor weather up on the Gotthard. We did each take away a couple of pleasing shots, but several locations, including the whole of Wassen really didn't feel like they had been covered as we had hoped. I guess this is what happens when you leave it until 2016 to visit the line. 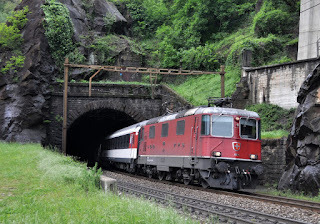 It will be interesting to see how quickly services migrate over to the base tunnel after it opens in June, and until all the traffic has I won't rule out another visit especially since I never tire of the Swiss locos. 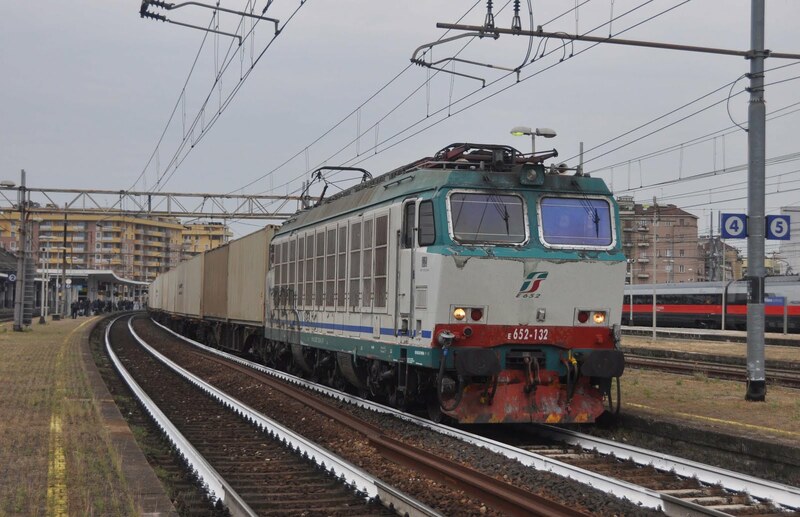 Italy was barely touched on this occasion but I do feel like it is only a matter of time until a trip is due- especially with some of the older electrics still working on freight. SNCF was its typical self in the end. Some bits went well, some less, and I've still not made it loco-hauled all the way between Paris and Boulogne or Belfort. I'll be back I'm sure. A special thanks to Rhys for the research into photo locations on the Gotthard!